What Is The Biblical Definition Of Holy? 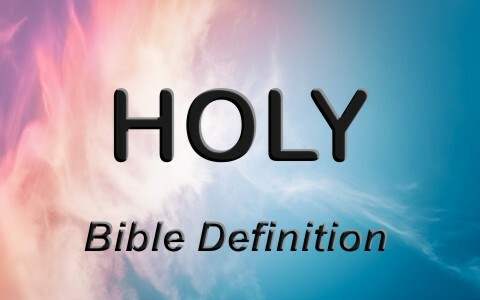 Here is what the Bible gives as a definition of holy. If you think God is concerned with His holiness in the Old Testament, consider the fact that holy is mentioned 431 times, not counting the word holiness. The Hebrew word for holy is “qodesh” which means “apartness, sacredness,” or “separateness” showing that God is altogether holy, sacred, set apart or separate from His creation. The idea is that God is totally different from us as He is spirit (John 4:24) and desires those who worship Him do so in spirit and in truth (John 4:23). The Greek word used for holy or holiness is “hagios” and means much the same thing that the Old Testament word “godesh” means, which is “pure, morally blameless” or “set apart” as in set apart for holy use, which is what the saints of God have been called to. The word “holy” is found in the New Testament 180 times and if you used holiness, then it’s almost 200 times that holy or holiness is used. It is obvious from the Scriptures that holiness is important to God and that we should regard Him as holy. So how is holy used in context? It is used in much the same way in the Old Testament as it is in the New Testament. The holiness of God is one of the most difficult of all of God’s attributes to try and explain. It’s like trying to describe the Shekinah glory cloud in a physical way that accompanies the presence of God. We can understand God’s attributes of love, mercy, and grace, but holiness is an attribute of God that is not shared with humans, although a person who repents and trusts in Christ has Jesus’ own righteousness accredited to their account as it says in 2nd Corinthians 5:21 that it was “For our sake he made him to be sin who knew no sin, so that in him we might become the righteousness of God” but that is not the same as having inherent holiness. In fact, God is so holy that no one can look at Him and live (Ex 33:20). It would be like looking at the sun and going blind as a result but God’s holiness and being in His presence would do more than that! The Bible teaches us, from both the Old Testament and the New, to be holy, just as God is holy, but how can we do that since we’re fallen creatures and our nature is anything but holy (Rom 3:10-12, 23; 6:23)? Part of that growth toward holiness is not being conformed to this world (Rom 12:1-2) and is an ongoing lifetime process called sanctification or to be set apart for holy use. The Apostle Peter writes, “As obedient children, do not be conformed to the passions of your former ignorance, but as he who called you is holy, you also be holy in all your conduct, since it is written, “You shall be holy, for I am holy” (1 Pet 1:14-16) as “you yourselves like living stones are being built up as a spiritual house, to be a holy priesthood, to offer spiritual sacrifices acceptable to God through Jesus Christ” (1 Pet 2:5). Peter appears to be quoting the Old Testament which says “’You shall be holy, for I am holy’” (Lev 11:44; 19:2). Since we are called to be holy as God is holy, although not to the same extent of course, we should “put away all malice and all deceit and hypocrisy and envy and all slander” (1 Pet 2:1). The church is “a chosen race, a royal priesthood, a holy nation, a people for his own possession, that you may proclaim the excellencies of him who called you out of darkness into his marvelous light” (1 Pet 2:9) so we should live a life of holiness, at least as much as is possible with us. God the Holy Spirit is the One Who works in us to sanctify us and make us more like God over time. Have you ever noticed that the Spirit’s name is always associated with holiness? Why isn’t it God the Holy Father and the Holy Son of God? Perhaps it’s because the primary work that the Spirit of God does is to make men and women holy by convicting them of their sin, bringing them to repentance and confession of sin, and driving them to the cross for the mercy of God through Jesus Christ while making them live a life that is more pleasing to God. The Holy Spirit then is designated as “Holy” because that is His primary work in the believer’s life. He is making us holy, day by day, and it takes a daily walk with God to stay focused on a Holy God. By the way, holiness is not the way to Jesus; Jesus is the way to holiness. We can’t get holy by our best efforts. It takes the power of the Holy Spirit to make the children of God live holy lives. We are told to “Go out of the midst of her, my people! Let every one save his life from the fierce anger of the LORD” (Jer 51:45) just as we are told in the New Testament by the Apostle John who heard a voice from heaven say “Come out of her, my people, lest you take part in her sins, lest you share in her plagues” (Rev 18:4) which even the Apostle Paul writes to the Corinthians “Therefore go out from their midst, and be separate from them, says the Lord, and touch no unclean thing; then I will welcome you” (2 Cor 6:17). We are not holy by nature but wicked, evil and even our hearts can deceive us (Jer 17:9) but God knows we need a heart transplant but we have good news, as Ezekiel writes, “I will give you a new heart, and a new spirit I will put within you. And I will remove the heart of stone from your flesh and give you a heart of flesh” (Ezk 36:26). If you’ve received a new heart from God, Paul would remind us “if anyone is in Christ, he is a new creation. The old has passed away; behold, the new has come” (2 Cor 5:17). Related reading: Who or What is the Holy Spirit?